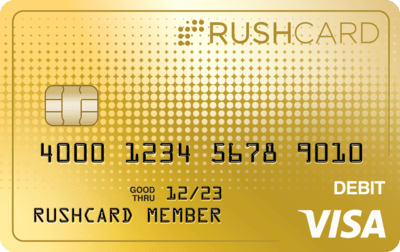 How do I get my tax refund directly deposited into my RushCard? You&apos;ll need the following information to direct deposit your tax refund to your RushCard, whether you are filing online, by mail, or through your local tax preparer. Account Number: The 16-digit Deposit ID found by selecting 'Set up Direct Deposit' in the mobile app (standard text message and data rates, fees, and charges may apply) or from the 'Account Settings or Direct Deposit' page in the account site. Can I have a tax refund from a joint return direct deposited to my RushCard? Yes. If filing jointly, make sure the name on your RushCard is the first person listed on your tax return. To be accepted and posted by RushCard, tax refund direct deposits MUST be in the name of the cardholder.